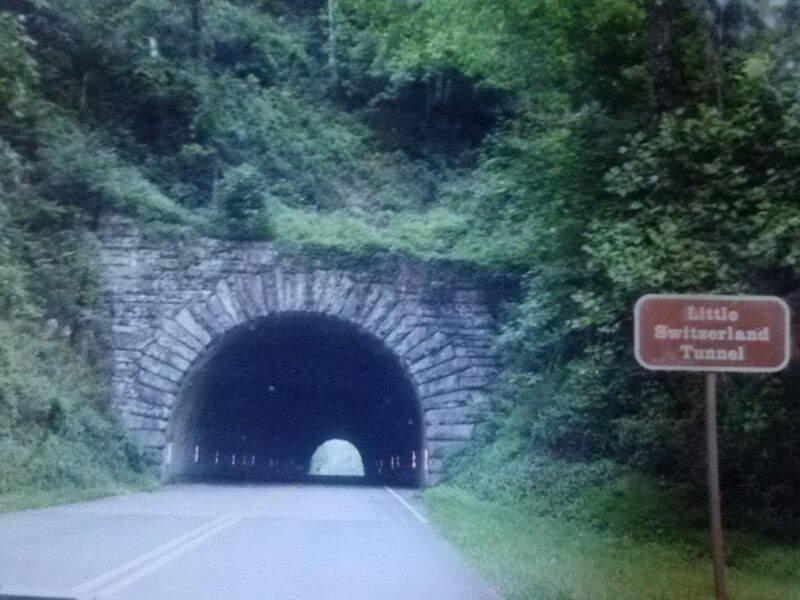 Located off the beautiful Blue Ridge Parkway in Little Switzerland, NC. and tucked away on a ridge overlooking the Black Mountains and Mt. Mitchell, the highest point in the Southeastern U.S. is our cabin, named MISTY RIDGE. Our mountain retreat. A 2 bedroom, 2 bathroom retreat for tranquility. The cabin layout offers privacy as each bedroom has an on suite bathroom on opposite ends of cabin. One with queen bed and bathtub, the other with twin beds and shower. Large deck for sunset viewing and mountain dreaming complete with dining table and rockers for relaxing. Gas fireplace, separate fire pit deck, washer/dryer, TV, DVD, charcoal grill. Fully furnished kitchen with everything you may need including a large picture window so you won't miss any wild turkey's going by! All linens, towels, and paper products furnished. Heat and A/C (although rarely needed!) Plenty of windows to let in the mountain air. Caretaker on duty for any assistance. We are so happy to share our mountain retreat with you. We live in Baton Rouge, Louisiana but get to our little piece of mountain paradise as often as possible. We love the outdoors year round. Hiking, fishing, backpacking, river rafting, camping, snow shoeing, cross country skiing-our cabin location let's us do all these activities within an hour's drive. We bought Misty Ridge after visiting the Little Switzerland area for 15 years. We were told of the cabin the day it went on sale as we were vacationing. We saw it and fell in love. Bought it and made a few updates, like adding in a picture window in the kitchen to let nature in. To us the cabin is magical for the tranquility it offers us. In fact, we even got married on our deck! It will forever be a special place for us and our family. We fell in love with this cabin for its large deck and the amazing views it offers. It has a ramp as an option to enter the cabin rather than steps, so we knew it would work for some of our elderly relatives. The inside décor with the wood work and stone fireplace was just what we had envisioned for a cabin. The large windows and skylights lets nature take a step inside. Queen bedroom has sink, toilet, tub/shower combo with window. Twin bedroom has sink, toilet, shower with window. Cabin overlooks the Black mountains and Mt. Mitchell, the highest point in the eastern U.S.
Local and incoming calls only. Gas fireplace controlled by thermostat. Limited-no streaming of movies or downloading of music. Fully equipped kitchen with all cooking utensils, pots, and pans. Gas range and oven, full size refrigerator, microwave, coffee maker, toaster, slow cooker, dishwasher, double sink and picture window. Dining table set with four chairs with additional chairs behind the table lining the bar. Table will comfortably seat 6 adults. Outdoor patio table seats 4. One TV in living room with basic cable. Plenty of books found throughout cabin to enjoy during stay. A basket full of traditional board games, card games, and puzzles. Large deck with dining table, chairs, bench, gliders, and rockers. Sugar Mountain and Beech Mountain Ski Resorts are less than an hour only away along with Hawksnest Snow Tubing resort, largest snow tubing resort on east coast. Grassy Creek Golf and Country Club only 15 minutes away in Spruce Pine. Our family had a wonderful stay here and hope to return soon. The cabin is comfortably furnished and set on a quiet ridge with Mountain View’s off the deck. Could not have had a better stay. Definitely will be back again. The cabin is just big enough to allow enough personal space yet just small enough to be comfy-cozy. The wind definitely blows there and can be heard inside so if you are used to sleeping in sheer quiet you may need to take that into consideration...it wasn’t bad at all for us as we sleep with a fan on anyway and it was only the first night we were there that the winds were blustery. The amenities and furniture were nice and exactly what is needed for a relaxing time. We loved the charm off all the wood features, especially the doors and hardware which added to the ambiance. The owners of the cabin were extremely generous and kind...Chris went above and beyond to make sure we were happy during our stay. The one thing to consider is the surrounding area “rolls up the sidewalks” kinda early so if you need any food, alcohol, or other necessities you may need to plan to get them early in the afternoon. We have already recommended this cabin to our friends and we will definitely be renting the cabin again if we are in the area. Thank you for a lovely stay at Misty Ridge. Cozy, relaxing cabin with an amazing view! This was just the kind of cabin I always visualize when I think of "getting away" from city life and finding the comfort of the beautiful Carolina mountains! It has all the modern conveniences but maintains its' rustic atmosphere! When we weren't out on a daily excursion we enjoyed the comfort of just relaxing inside by the fire or on pleasant days enjoyed grilling out and marshmallows on the fire pit! The two days we were snowed in were also relaxing. While we didn't lose power instead of just watching tv or spending "electronics" time there were plenty of board games available that we took advantage of. The worst part of the trip was knowing we had to leave and return to city life!! It was a pleasure to stay in beautiful Little Switzerland at Misty Ridge for two weeks! Our third visit and always wonderful! This cabin is amazing, you feel right at home the first minute you are there. We will be back again soon! Felt like home the minute I drove up. Very clean. Beautiful views. Will stay again. The deck alone earns 5 stars! Gorgeous setting and views from the deck, and a cozy cabin to boot! Very easy to get to the Blue Ridge Parkway and lots of hikes and waterfalls. Chris and Susanne made it super easy and worry-free. Perfect for a weekend away, but we wish we'd stayed longer! Cabin is right off the Blue Ridge Parkway. Enjoy lunch at the Little Switzerland café then take a short stroll to a waterfall. Plan day hikes on the Appalachian Trail. In the fall, visit the Altapass Apple Orchard to pick your own apples. Begin the morning with coffee on our deck and end the day watching the sunset there. Visit Mt. Mitchell and the Mineral Rock Museum. Winter activities include skiing and tubing less than an hour away.